September marked the second full year of the Green Roof Garden, so we want to update you on how it’s growing. Overall, it’s been a good year, and most plants are thriving. We started the year with a good amount of precipitation, but an especially hot and dry period with sustained temperatures nearing 100 degrees in early July made us worry that a significant number of plants wouldn’t survive. Though we agonized over the decision, we watered for a half hour on two days in the first and second weeks of July (about a half an inch of water each time), which stopped the decline. Thankfully, about a week after irrigating, we received enough rain to saturate the growing medium; subsequent rains throughout the remainder of July reinvigorated the plants, and we did not need to water again. Most of the plants that were struggling recovered well, and ended the season in good health. Although we irrigated twice, we still think the roof is sustainable. On the Josephine P. & John J. Louis Foundation Green Roof Garden North, we added plants where there were losses in 2010 including several new evaluation plants such as Aster oharae. We collected this plant on the seashore in the far east of Russia and didn’t expect it to do as well as it has in the heavy soil of the Lavin Plant Evaluation Garden. It seemed like a natural to try it on the Green Roof Garden in the coarse growing medium, which is much more like its native growing conditions; its blue flowers appeared intermittently throughout the growing season. Scabiosa olgae, collected in the Caucasus Mountains, is also doing well; its lavender-blue flowers rival any of the cultivated Scabiosa, and it has unusual fuzzy leaves. Overall, we’ve lost about 10 percent of the 40,000 original plants, with two significant losses over the past two years: Butterfly weed (Asclepias tuberosa) and perennial lupine (Lupinus perennis). Both were replanted this year to retest them, because we like to give every plant at least two tries at evaluation. So far, the depth of planting medium seems to influence survival. We have 4-inch, 6-inch and 8-inch planting depths. During the drought, we saw the greatest suffering in the 4-inch depth. On the Ellis Goodman Family Foundation Green Roof Garden South, we’ve been using 4-inch-deep square black plastic planting trays to demonstrate a common commercially available green roof product. We observed that the plants in the trays, especially those growing close to the edges, suffered the worst during the drought. The black plastic holds heat more than the other planting areas, which can cause additional stress on the plants. Overall, the ornamental grasses are doing very well and none of them have sustained losses, including feather grass (Calamagrostis brachytricha), little bluestem (Schizachyrium scoparium), and prairie dropseed (Sporobolus heterolepis) — both the species, and the cultivar ‘Tara’. Woody plants such as the junipers and Gro-low sumac are doing well in 8-inch depths, as are the lavenders and Rosa carolina. As part of the evaluation we are not only monitoring which plants survive, but also observing the ornamental characteristics, size, and how the plants can be used in the landscape. 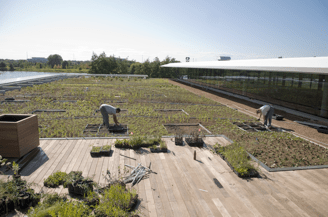 The Green Roof Garden was designed by Oehme, Van Sweden and Associates to be an ever-changing landscape of perennials, with interesting color, blooms, and texture. Some of the plants are performing similarly to how they grow in a typical garden and some are not, so we’ll be assessing both their ornamental qualities as well as their suitability to green roof culture. One such example is New England aster (Symphyotrichum novae-angliae), which blooms well, though its lower leaves turn brown and are unattractive during the flowering period. The fact that the plants are thriving on the roof but have some ornamental issues could be solved by interplanting with ornamental grasses that would hide the aster’s lower stems. A few plants have spread a bit too aggressively by seed and were selectively removed this year: black-eyed Susan (Rudbeckia hirta), seeded widely on the south roof and was removed wherever it overgrew other plants; hawkweed (Hieracium ‘Leopard’), which has a pretty spotted leaf and yellow flowers, spread from the north roof into many areas on the south roof; and partridge pea (Chamaecrista fasciculata var. fasciculata) reseeded densely rather than widely, smothering many neighboring plants. Another factor we are evaluating is where the plants move on the roof; for example, are they moving into different soil depths or into more protected or shaded locations on the roof? In general, we’ll allow them to move in the evaluation areas, as long as they are not acting like thugs or weeds. This year, the public responded more positively to the native side (South Green Roof Garden) than last year, because the plantings had filled in more. We added a native blue salvia (Salvia azurea) that blooms late in the season, and large beardtongue (Penstemon grandiflorus), which has big, beautiful red or pink flowers in spring. Both plants were especially well received by visitors. This year we noted that sideoats grama (Bouteloua curtipendula) looks better planted close together en masse in the 8-inch area, as opposed to more sparsely planted in the 4-inch area. We are seeing plants like goldenrod (Solidago sp.) and tickseed (Coreopsis tripteris) appear on the roof this year; these must have seeded onto the roof from the ground below, as they were not planted here. An important question we’re considering in the evaluation plots is whether this a garden or a habitat, and depending on the answer, should we let plants move around and seed-in from other landscapes? Fall color began in late September and early October, and a number of plants put on exceptional autumnal displays. Big bluestem (Andropogon gerardii) is showing nice deep-purple fall color; the foxglove beardtongue (Penstemon digitalis) has turned a beautiful wine red. The various asters are blooming really well; some that are particularly nice this fall include azure aster (Symphyotrichum oolentangiense), silky aster (Symphyotrichum sericeum) and smooth aster (Symphyotrichum laeve), the latter of which has nice big clusters of lavender-blue flowers. Aromatic aster (Symphyotrichum oblongifolium) is similar to the New England aster in flower, but has a bushier habit on the green roof. We had a heavy infestation of lace bugs, which caused many asters to look sickly earlier in the summer. Fortunately, the asters recovered their health and flowering was unaffected. We saw a variety of birds and insects on the Green Roof Garden this year. Swallows were very active all summer, and there were several killdeer pairs nesting early in the season. Other common visitors were robins and mourning doves, and we occasionally saw a pair of mallard ducks. A variety of butterflies, bees and grasshoppers were also observed. 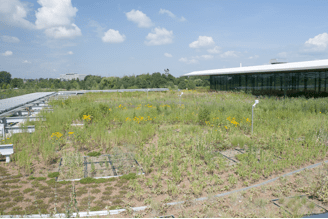 A visiting scientist was monitoring the green roof for ants in early summer, but he didn’t find any. He will continue to monitor the roof for the next couple of years. Thankfully, no geese, chipmunks or squirrels have appeared on the green roof. Plans are underway to publish a full evaluation of the Green Roof Garden and hopefully in the next few years we’ll be able to recommend a good list of plants for green roofs. Though it is warmer, windier and drier on green roofs, clearly it’s not completely inhospitable to plants, as evidenced by the many thriving plants in the Green Roof Garden. The Green Roof Garden is located on the roof of the Daniel F. and Ada L. Rice Plant Conservation Science Center. The 16,000-square-foot green roof is accessible to the public via a grand staircase, and an overlook with interpretive panels educates visitors about aspects of rooftop gardens. Two distinct areas serve specific functions: the Ellis Goodman Family Foundation Green Roof Garden South features regional and national native plants, many of which are not currently used as rooftop plants; the Josephine P. & John J. Louis Foundation Green Roof Garden North features a mix of plants known as good green roof plants, plus native and exotic plants that have potential for green roof use. Generally, the plants are sun-loving, drought tolerant, and can withstand windy conditions. Visit www.chicagobotanic.org/research/building/green_roof for more information on the Green Roof Garden.